From thriving to languishing to a recent resurgence, the Campbeltown whisky “region” that technically lost its status according to the Scotch Whisky Society. Today Campbeltown has only two producers – Springbank Distillery with its ‘extra’ plant Glengyle and Glen Scotia. Some of the distilleries that closed with prohibition and depression became brands under the Springbank family – Glengyle, Hazelburn and Longrow. Mitchell’s Glengyle Ltd. are very proud to be continuing and adding to the great Campbeltown Distilling tradition and the choice of name reflects that Kilkerran is derived from the Gaelic ‘Ceann Loch Cille Chiarain’ which is the name of the original settlement where Sait Kieran had his religious cell and Campbeltown now stands. Kilkerran is thought to be a suitable name for a new Campbeltown Malt since it was unusual for the old Campbeltown distilleries to be called after a Glen, a custom more usually associated with the Speyside region. A not to subtle dig at Glen Scotia? Palate – Fabulous! Peat perfectly balanced with sweet cinnamon and spice. Just a great balance between the three elements like a well cooked beautiful meal. Some chilli spices, more of that paan character too. There was no doubt we loved it however a few remarked how the peat in the nose was initially so intense it took over the show. However after time to oxidate and the addition of water, everything clicked into perfect harmony. Particularly the balance on the palate was simply outstanding. Our speculation turned to discussion the quality of peat – what was clear was this was no Islay yet most hesitated to guess beyond that. Overall we found it well constructed and clearly cask strength. The reveal of Campbeltown and for most of us, only our second Kilkerran, was a cementing of a growing opinion that these folks clearly know what they are doing. What else do we know? That it was distilled at Glengyle in Campbeltown, is non-chill filtered with no added colouring. We understand it is a 50 PPM. This was their 1st release which is now sold out, so if you were curious about how much would this set you back…. will need to check out a different version of this whisky – currently retailing at Master of Malt for approx £49.96 – complete value for quality! 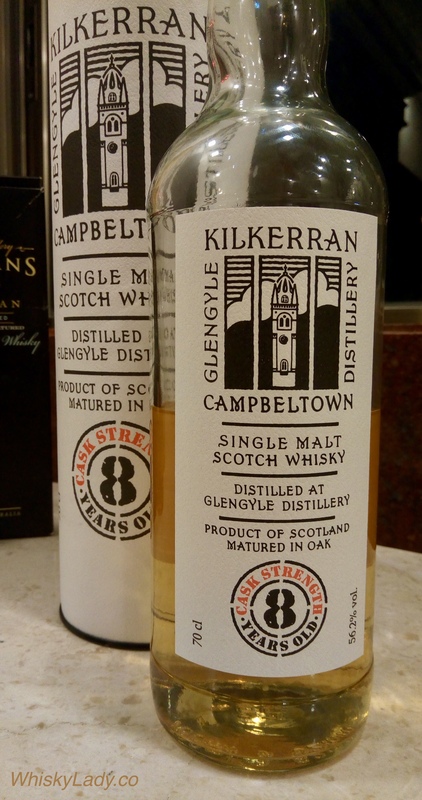 This entry was posted in Campbeltown, Scotland and tagged Kilkerran, Kilkerran 8 year Peated Cask Strength 56.2%, Peat by Carissa Hickling. Bookmark the permalink.